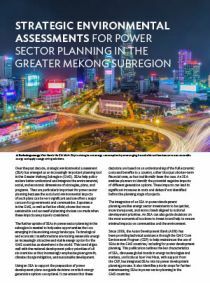 This publication shows how strategic environmental assessments can help the Greater Mekong Subregion countries create sustainable national power development plans. It outlines the key characteristics of strategic environmental assessments, discusses global trends in energy technologies and markets, and identifies priority steps for further mainstreaming strategic environmental assessments in power sector planning in the six Mekong countries. In Viet Nam, for instance, these environmental assessments have been integrated into the power development planning process with support from the Asian Development Bank.